Effective 5 March 2018, each entity in Indonesia must identify and report its beneficial owner(s) to Authorized Institutions to combat money laundering and terrorism funding. This new requirement was stipulated in President Regulation No. 13 of 2018 concerning Implementation of the Principle of Knowing Beneficial Owner of Corporations related to the Prevention and Eradication of Money Laundering and Terrorism Financing Crimes (“PR 13/2018”). This mandatory reporting requirement applies to legal and non-legal entities, i.e. limited liability companies (Perseroan Terbatas), foundations, associations, cooperatives, limited partnerships, Firms/unlimited Partnerships, and other forms of corporations (collectively called “Corporation”). is the true (ultimate) owner of the company’s share capital. Governmental Institutions that have the authority to supervise and regulate the business of the Corporation. conduct other administrative activities within the scope of duties and responsibilities in accordance with the provisions of PR 13/2018. Further, the Authorized Institutions can cooperate with Financial Transaction Reports and Analysis Centre or other related institutions to combat money laundering and terrorism funding. For sanction, the PR 13/2018 only mentions that any violation of the relevant provisions of PR 13/2018 will be punished in accordance with the relevant laws and regulations. 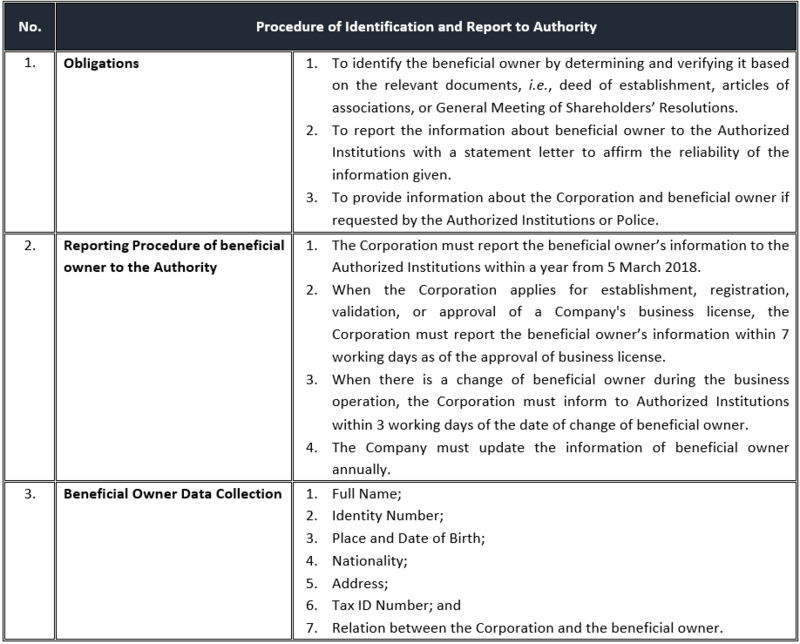 provide the beneficial owner’s information to anyone, who requests such information in accordance with the laws and regulations concerning public information disclosure. The PR 13/2018’s ultimate objective is combat money laundering and terrorism funding, hence only an individual or natural person is identified and reported as beneficial owner to the authority, hence Corporations are excluded. Further, the obligations to identify and report of beneficial owner also support the Investment Law No. 25/2007, which prohibits nominee arrangement, where an individual uses other people name for establishing and operating a legal entity. If you have any questions or require any additional information, you may contact Leoni Silitonga, Sianti Candra or the ZICO Law Partner you usually deal with.